Besides their companionship and charm, cats are helpful to the flower garden in that they keep pests like rabbits, voles, and moles away. However, cats can also cause destruction to gardens by digging (and leaving unauthorized deposits), using plants as a soft napping spot, and chewing. Target your cat’s unwanted behavior with these safe repellents. Bitter Apple products act as a taste deterrent rather than a complete repelling agent around plants. The product is not rain proof, but it is excellent on house plants that cats like to nibble on, like your expensive orchids. Old rose branches don’t compost well, but they will make your cat think twice about making a shortcut through your prized dahlia stand. If you only need to exclude your cats from an area temporarily, such as a fresh patch of dirt, cover the canes with mulch afterwards to help them break down into the soil. A group of bamboo sticks planted here and there will deter cats from settling down to nap on your petunias, but green floral wire is less visible, saving your garden from the appearance of a punji jungle pit trap. Cut heavy gauge floral wire into 10-inch pieces, and insert at regular intervals in seedbeds, window box perches, and anywhere cats like to laze and dwell. This method is slightly less effective on plants cats relish, like nepeta (catmint). When Felix decides that your azaleas make an excellent digestive aid, it’s time to break out the big guns. 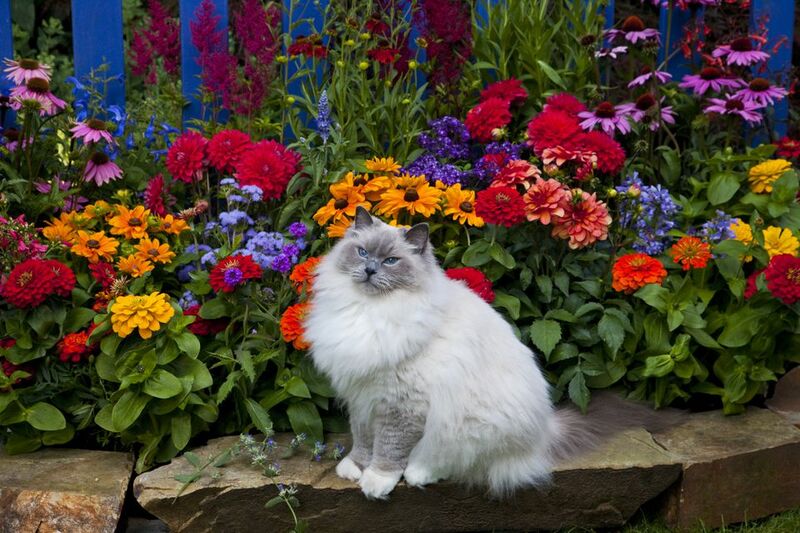 After all, azaleas and many other favorite garden flowers like baby’s breath, nicotiana, and lilies are poisonous to cats, causing symptoms that range from mild gastrointestinal upset to seizures or coma and death, according to the ASPCA. In this case, a healthy application of hot pepper spray can deter cats with its spicy taste and odor. Some gardeners like to make spray with peppers they grow, but commercial varieties can have more sticking power due to waxes in the formula. Just as there are flowers that attract cats, there are others that drive them away. Flowers with aromatic foliage, like Russian sage and lavender, don’t appeal to cats. Flowers with prickly foliage, like the sea holly, globe thistle, or the tropical grevillea, are resistant to cat and most other animal nibbling as well. What can you do when the offending cats aren’t yours to train, but are a group of marauding neighborhood cats or a feral population? A motion triggered sprinkler will act as your sentry 24 hours a day. The upside of using a sprinkler like the ScareCrow or the Havahart Spray Away is that your flowers will get a drink every time an uninvited visitor approaches. The downside is that you will get sprinkled if you forget to deactivate the device before you go out to pull weeds. Tape is non toxic, cheap, and uses the element of surprise to deter cats. Placing tape balls made of masking tape or duct tape on the soil is an effective strategy for urns or window boxes that the cat has turned into a lookout post. The first time or two the cat finds itself dealing with these annoying cling-ons, it will be much less likely to jump up, as it cannot preview its landing spot. A semi-shaded garden bed with a soft mulch of grass clippings can make your cat forget she ever made goo-goo eyes at your roses. Fill this kitty Garden of Eden with safe edibles, including cat grass, cat mint, or pansies. Although chicken wire gives the same effect, it is more expensive and difficult to work with than bird netting. You can anchor sheets of plastic bird netting over newly planted beds to prevent cats from digging in freshly worked soil. You can also lay strips of netting between plants to stop digging activities. Like the cat garden, a sandbox isn’t a deterrent, but rather a lure to give cats a new place to dig. Assemble a simple bottomless box from 2 by 4 lumber cut to the size that will accommodate your size and number of cats. Fill with playground sand, and top off as needed.